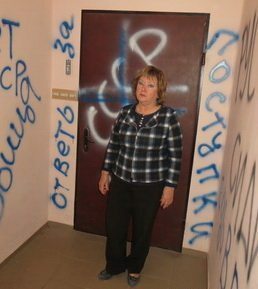 May 12, 2017 (EIRNS)–On Victory over Fascism Day, May 9, Neo-Nazi “National Corps” (former Azov Battalion unit) staged a new attack on Progressive Socialist Party of Ukraine (PSPU) leaders Dr. Natalia Vitrenko and Vladimir Marchenko. Early that morning, as the USA, Canada and European countries had celebrated V-E Day (May 8), the 72nd anniversary of the Nazi surrender in World War II, and the countries formerly in the Soviet Union prepared for their customary marking of the occasion as Victory Day, May 9, these leading anti-fascists in Ukraine, both of them former members of Parliament, heard their doorbells ring and threatening voices outside in the hallways. 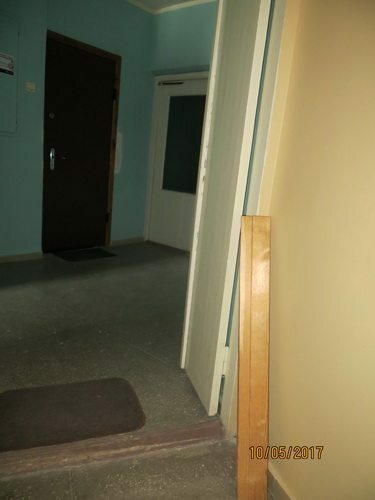 Gangs from the neo-Nazi “National Corps Party,” formerly a unit of the neo-Nazi Azov Battalion under the Ukrainian Ministry of Internal Affairs, were attempting to break down the doors of their apartments. During a five-hour stand-off, police refused to remove the attackers forcibly. The neo-Nazis declared that their purpose was to prevent Vitrenko and her PSPU from holding Victory Day rallies or taking part in the Immortal Regiment march, in which people in Kiev, as in cities throughout the world, were set to honor family members who died fighting fascism, or survived as veterans of the war. Vitrenko is famous not only for her now nearly quarter-century-long battle against the destruction of Ukraine through the imposition of neoliberal monetarist economic policies, but also for warning for two decades of an insurgent fascist movement in Ukraine, marching under Nazi-derived banners and those of Ukrainian 20th-century fascist Stepan Bandera’s Organization of Ukrainian Nationalists. Even after her warnings came true, when the neo-Nazis provided shock troops in the U.S.- and EU-backed coup of February 2014 that overthrew the elected President of Ukraine, Victor Yanukovych, Vitrenko has continued to fight to expose them and their backing from the West. In a communication today to friends abroad, Vitrenko voiced hope that Western leaders could be organized to pressure the Ukrainian government to put a stop to the attacks on the PSPU by the Azov Battalion and its political spin-offs like the National Corps party. She noted, especially, that the U.S. Congress has officially recognized that Azov is “neo-Nazi.” Dr. Vitrenko situated the attacks on her party within an evaluation of the political situation in Ukraine, where one current scenario is for a military coup to be staged by Internal Affairs Minister Avakov and allies of his who have also been sponsors of the neo-Nazi gangs. * May 10, “Political terror: Azov neo-Nazis continue persecution of PSPU,” article by PSPU political commentator Victor Silenko, detailing the escalation against Vitrenko throughout 2016-2017. As the leader of a Ukrainian opposition party, People’s Deputy of Ukraine of the 2nd and 3rd Convocations, and candidate for the Presidency of Ukraine in 1999 and 2004, I am compelled to appeal to you to review the situation around the gross violation of the rights of citizens of Ukraine to freedom of speech, freedom of thought, freedom of expression of their views and convictions, freedom of association in political parties and public organizations, and freedom of assembly for the peaceful conduct of actions, rallies and demonstrations. These rights and freedoms are not only norms of the Constitution Of Ukraine (articles 34, 36, 39), but are also international obligations of Ukraine in accordance with the European Convention on Human Rights and the Pact on Civil and Political Rights, both of which have been ratified by our country. The present appeal is motivated by the publicly displayed lawlessness of the Ukrainian neo-Nazis, who are threatening Ukrainian citizens, including me personally, with reprisals in connection with the upcoming Victory Day, marking the victory of the Soviet people in the Great Patriotic War. The law enforcement agencies are not only failing to stop the aggressive attacks by representatives of right-wing radical political forces, but are themselves taking an active part in intimidating the citizens of Ukraine, for whom May 9 is not only a national holiday, but a day of remembrance and respect for the heroism of our glorious fathers, grandfathers, and great-grandfathers, who gave their lives to defeat Hitler’s Nazism, liberated our land, and in a coalition with other countries freed the entire world from fascism. 2. Ukrainian nationalists are planning to impede the holding of the Immortal Regiment action in Kiev on May 9, says Mykola Kokhanivsky, leader of the OUN [Organization of Ukrainian Nationalists] Volunteer Movement, a nationalist organization. — Kokhanivsky wrote in Facebook. The media, abetted by Ukraine’s law enforcement agencies (or in cahoots with them), is without question conducting informational and political terror, making Ukrainian citizens who have beliefs different from those of the neo-Nazis into targets for physical reprisals. Sticking loathsome labels on me and people like me, humiliating us by vulgarizing our sincere convictions and values as orders from Moscow—these are the methods used to prepare the public for harassment and physical reprisals against us. I think that the world community knows about the  tragedies of May 2 in Odessa and May 9 in Mariupol, and about many other things during these past three years in Ukraine, testifying to the Ukrainian neo-Nazis’ lawlessness and unrestrained actions, which they do with impunity. And the Ukrainian law enforcement agencies, which are obligated to defend the rights and freedoms of the citizens of Ukraine, do nothing. It is my deep conviction, that if the world community fails to condemn these processes in Ukraine and to force the President of Ukraine and its law enforcement agencies to carry out their obligations to defend the rights and freedoms of the citizens of Ukraine and to put a stop to the activity of the right-wing radicals, then a Nazi state will be formed in the center of Europe in the near future, and this will give rise to a Third World War. I have addressed you repeatedly, stating that the inaction of Ukrainian law enforcement agencies with regard to Ukrainian Nazis has created the conditions for them to carry out political harassment, vigilantism, and murder against journalists, political figures, and citizens of Ukraine, whose political views and values do not coincide with their Nazi ideology. There are countless examples, from the May 2, 2014 tragedy in Odessa to the murders of O. Buzyna, O. Kalashnikov, P. Sheremet, et al. The Ukrainian regime’s proclamations of the European values of freedom of speech, freedom for opposition activity, freedom of expression, and political pluralism, in reality have turned out to be empty words and false promises to cover up the monstrous reality, that the Ukrainian Nazis are out of control and are going unpunished, while law enforcement agencies do nothing to defend the rights and freedoms of Ukrainian citizens, including opposition politicians, under the Constitution and under [international] Conventions. On May 4, 2017, on the eve of the celebration of the Great Victory [in World War II], I personally wrote to you, demanding that you defend our rights and freedoms, and indeed our lives, from physical reprisals by the Nazis, whose threats had come out in the media, as I indicated in my Appeal. Despite my Appeal, once again the law enforcement agencies took no action. As a result, at 7:30 a.m. on May 9 my apartment doorbell began to ring, and demands to open the door were made by a group of people representing the “National Corps.” They demanded that I refrain from taking part in the day’s mass rallies and that I stop supporting the Russian world. The doorbell-ringing and threats by the Nazis were continuous. I called the police, who arrived after one hour and determined that offensive graffiti had been painted on the door of my apartment and that the Nazis were continuing to blockade it. At 8:00 a.m. on the same day a group of 15 armed men attacked my deputy, People’s Deputy of Ukraine of the 1st, 2nd and 3rd Convocations Vladimir Marchenko. First they blocked the driveway of the building where Marchenko lives with his family, and then they physically pushed aside the concierge, broke into the building, and went upstairs to Marchenko’s apartment. 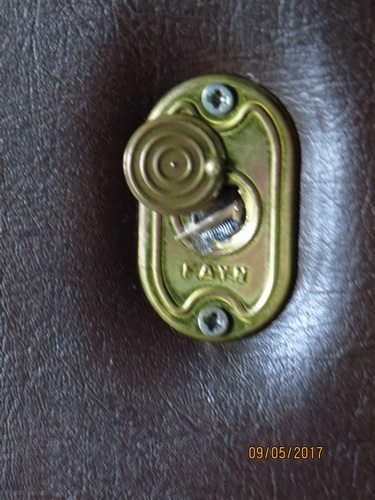 They began to ring the doorbell and demanded the door be opened, and then cut off the lights and started smashing the door and trying to break the lock. They spray-painted the door with some kind of poisonous paint, the smell from which (or from some kind of gas) got into the apartment. At that time, in addition to Vladimir Romanovich (Marchenko), his wife and daughter, also his two minor grandchildren were in the apartment, and were naturally terrified. Vladimir Marchenko had to call the police. After half an hour, one person arrived, who was absolutely incapable of dispersing the blockade, defending V. Marchenko’s family from Nazi threats and insults, or allowing freedom of movement for all the members of the family. Or did the police have no intention of doing those things?! I demand an immediate investigation of the acts of terror committed against me and Marchenko, and criminal prosecution of both the organizers of these depredations and those who carried them out. I demand the protection of our rights and freedoms, including security. Consider this statement of mine to be an official statement to the police from me personally and from Vladimir Romanovich Marchenko. Natalia Vitrenko, Chairman of the PSPU — May 9, 2017 11:05 a.m.
Natalia Vitrenko and Vladimir Marchenko believe that these actions by the neo-Nazis and the unlawful inaction of the police are violations of their constitutional rights, guaranteed by Articles 3, 8, 15, 21, 22, 23, 30, 34 and 26 of the Constitution of Ukraine and Articles 5, 8, 10 and 14 of the European Convention on Human Rights, and that the crimes committed against Vitrenko and Marchenko come under Articles 15, 115 pt. 1, 146 pt. 3, 296 pt. 2, and 346 pt. 1 of the Criminal Code of Ukraine, as has been set forth by N. Vitrenko and V. Marchenko in their statements to the police. The very fact that neo-Nazis and neo-fascists are called activists in Ukraine, and that, in violation of Article 68 of the Constitution of Ukraine, they are permitted to carry out summary justice actions against their political opponents, using various types of violence, clearly demonstrates the latest outbreak of Ukrainian fascism. On May 9, 2017 fighters from the neo-Nazi National Corps Party blockaded the apartments of Progressive Socialist Party of Ukraine (PSPU) Chairman Natalia Vitrenko and her deputy Vladimir Marchenko, in order to prevent these anti-fascist opposition politicians from taking part in an Immortal Regiment march in the Hero City of Kiev. The attempts to intimidate these participants in the celebration of May 9 were in vain, however: the Progressive Socialists posted on their party website congratulations to the citizens of Ukraine on Victory Day, marking the victory of the Soviet people in the Great Patriotic War, thus confirming their unflagging devotion to the cause of their great and glorious ancestors, whose feats on the battlefield saved humanity from the brown plague of fascism, which now has raised its head in Ukraine under the Maidan regime. As is well known, the National Corps Party was founded Oct. 14, 2016, based on the public organization called the Azov Civil Corps, a youth wing of the special forces Azov Battalion within the National Guard of the Ukrainian Ministry of Internal Affairs. This new political force was created by renaming the Ukrainian Patriot Party, which had already been registered by the Ukrainian Ministry of Justice and was headed by the former Azov fighter, independent member of the Supreme Rada Andriy Biletsky aka White Boss. At the same time the newly formed party abandoned the other, better-known Azov symbol, a mirror image of the runic Wolfsangel, symbolizing capture of the enemy (which had been used in Nazi Germany, in particular by the Waffen-SS Tank Division Das Reich), in favor of a stylized trident with lightning. Thus the National Corps replicated what the Social-National Party of Ukraine (SNPU) had done on Feb. 14, 2004, when, upon being renamed as the Svoboda [Freedom] Party, it likewise abandoned that symbol, finally realizing that, despite all attempts to interpret it as a monogram of the Latin letters “I” and “N,” standing for “Idea of the Nation,” the symbol was perceived by the public as nothing other than the Nazi Wolfsangel. The ideology of this political superstructure of the Azov Regiment, often called in the media the “private army” of Minister of Internal Affairs Arsen Avakov, is “social nationalism,” based on principles of “race identity, social orientation, and a great-power concept”; this is a modern variety of Nazism. This is why, as recently as May 3, 2017, the U.S. House of Representatives officially forbid Ukraine from spending any U.S. funding on support for this particular armed unit. The law they passed allows the Pentagon to allocate $150 million through September of this year for military aid to Ukraine, including for training, lethal defensive weapons, machinery and equipment. But the USA also defined the purposes for which money received by Kiev is not to be spent. “None of the funds made available by this Act may be used to provide arms, training, or other assistance to the Azov Battalion,” states the document. “If there’s one simple lesson we can take away from U.S. involvement in conflicts overseas, it’s this: Beware of unintended consequences… Overzealous military assistance or the hyper-weaponization of conflicts can have destabilizing consequences and ultimately undercut our own national interests. I am grateful that the House of Representatives unanimously passed my amendments … to ensure that our military does not train members of the repulsive neo-Nazi Azov Battalion,” said one of the co-authors of the amendments, Rep. John Conyers, at the time. The first act of political terror by the Azov neo-Nazis against the PSPU was the events of March 17, 2016, when young thugs from the Civil Corps unsuccessfully attempted to break up a Left Opposition rally outside the National Museum of Ukrainian History in Kiev, where there is a memorial stone with the inscription “The land of Rus came from this place”; the occasion was the 25th anniversary of the All-Union and All-Ukraine Referendums of March 17, 1991 on the preservation of the USSR. During the attack the fascist hoodlums used tear-gas against the participants in the peaceful action, beat up elderly people, threw stones at the leader of the Progressive Socialists, and then went off to report on their “peremoga” [Ukr., “victory”]: on 112 Ukraina TV, Azov leader Nazar Kravchenko announced the “dispersal of the rally” and even fantasized on the theme that PSPU leader N. Vitrenko had “fled” the scene, whereas in reality she had not only stood firm in the face of the onrushing attackers, but had continued the rally after the neo-Nazis disgracefully fled when rally participants fought back. The second act of political terror was the events of Oct. 28, 2016, when Azov fighters, led by a certain deputy commander of a reconnaissance and subversion group in the “Anti-Terror Operation” [ATO, the Kiev government’s war on the self-proclaimed Donetsk and Lugansk People’s Republics, which refused to accept the Feb. 2014 coup d’état –Editor]—Nikita Shatilin, raided and seized offices belonging to Siver Ukrainia LLC, which had been rented on a fully legal basis since 2003 by the PSPU and the public organizations Gift of Life, Eurasian People’s Union, and Assembly of Orthodox Women of Ukraine. leaders of an anti-fascist party, demanding to be let in and threatening physical reprisals for any participation in the Immortal Regiment march in Kiev. The police failed to carry out its (and, consequently, the state’s) functions. In violation of the law, the Constitution Of Ukraine, and the European Convention on Human Rights, the police did not arrest these fascist youth, did not remove them from the hallway, and did nothing to defend the rights and freedoms of the PSPU leaders. Natalia Vitrenko had to make three calls before the police even came. 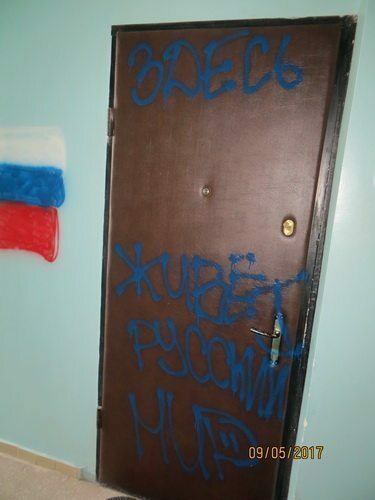 Only five hours after the start of this intimidation action did the neo-Nazis leave, after spray-painting offensive graffiti on the doors and the hallway walls of the leaders of an opposition political party, which opposes the falsification of the outcome of the Second World War—the Great Patriotic War, for our people—and the rehabilitation of Hitler’s collaborators from the Organization of Ukrainian Nationalists and Ukrainian Insurgent Army (OUN-UPA). All of these events are evidence that the ruling clique, which seized power with the assistance of neo-Nazi guerrillas in the Feb. 2014 coup, is persistently persecuting the PSPU—a legal political force, which conducts its activity strictly in accordance with the law—for its consistent position that it is impermissible to make heroes of “Ukrainian-German nationalists,” and which has repeatedly warned that such a policy will inevitably lead to the disintegration of Ukraine, as indeed has happened under the Maidan regime. Therefore if there is somebody in our country who should be prosecuted for actually “anti-state activity,” it is the representatives of the ruling regime and their neo-Nazi puppets, who have jointly destroyed the Ukrainian state under fascist Banderite slogans. One can wish them only one thing: if you want to find separatists, look in the mirror—and then don’t blame the mirror for your own ugliness.